So, you might be asking, what exactly did those happy campers do to get their (awesome, amazing, & outstanding!) patches? They logged into their accounts in Ares Digital 2.0 (our digital database-&-digital-perks-delivery system) once we had it ready to roll, and updated those accounts with current, complete shipping information (full name, full address–the details your mail carrier, and all the mail carriers in between, need to have in order to successfully get goodies from here to you). Make sure you’ve logged into your AD2.0 account here and provided your current/correct shipping address (as described earlier). 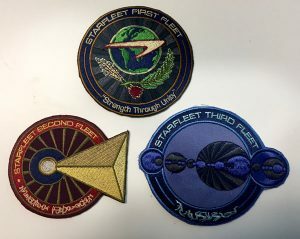 AXANAR Kickstarter donors who donated between $10-$30 are now eligible to receive patches from the campaign–but only if they choose to!–by sending the s/h fees in either the amount that gets them the two promised “Stretch Goal” patches OR at the amount that gets them the “Stretch Goal” patches AND the donation-level patch. Include a memo in the Paypal payment, that it’s for the “Axanar Kickstarter Stretch Goal Patches”. Lastly, log into your AD2.0 account and make sure your shipping info is updated/correct. Okay… so the web site is changed… but, now the password I set in September 2016 is no longer considered valid. And, when I reset, the new password is considered incorrect as well!